Honduras is currently one of the most violent countries on the planet that is not at war. The violence is carried out by transnational criminal organizations, local drug trafficking groups, gangs and corrupt security forces, among other actors. Violence is the focal point for the international aid organizations, governments and multilaterals providing Honduras with assistance, and it is the central theme of media coverage inside and outside of of the country. There are good reasons for this focus. Violence disproportionately impacts people in poor and marginal areas and tends to remain concentrated in those communities, closing the circle on a vicious cycle that impoverished nations find hard to break. In addition, violence impedes economic development and disrupts lives across a wide socio-economic spectrum. It can lead to major demographic shifts and crises as large populations move to urban areas or try to migrate to other nations. It can undermine governance and democracy, and it can serve as a justification for repression and hardline security policies that divert resources away from much-needed social and economic programs, thus perpetuating the problem. Organized crime plays a role in this violence, but it is more like the gasoline than the engine: it provides an already corrupt system with the fuel it needs to run. That corrupt system is the focus of this study on Honduras. Its most visible manifestation is an inept and criminalized police force that a former security minister once called “air traffic control men” for drug flights coming into the country.1 Parts of this police force also work as custodians and assassins for criminal groups; rob drugs and resell them to the underworld; and, for a price, they can attack client’s rivals and disrupt criminal investigations. This is one part of a multipart series concerning elites and organized crime. Read full Honduras report (pdf). See other parts of the series here. But beneath this most obvious form of criminal connection to state officials is a more insidious brand of corruption. This is further from the headlines and much more difficult to tackle since it is embedded in the country’s political, economic and social systems. It operates in a gray area, mixing legal and illegal entities, paper companies and campaign contributions, and sweeping its illicit acts under the rug using co-opted members of the justice system and security forces. What we are talking about, of course, is the elite connection to organized crime that this investigation exposes. The elites in Honduras are not like those in the rest of the region. The traditional, agro-export and industrial elites who rule in places like Guatemala, El Salvador and Nicaragua are less prominent in Honduras, mostly because of the country’s long history as an enclave economy dominated by multinational companies: the original Banana Republic. Instead, the country’s most powerful economic elites have emerged from the service, banking, media, and telecommunications sectors. They are called transnational elites since many of them are first or second generation immigrants from the Middle East and Eastern Europe and depend on international business dealings to accumulate capital. Traditional, land-based elites are present in Honduras. But they have long been relegated to a second tier, forced to seek power through control of government posts, rather than using financial leverage. While the ruling elites in Honduras do not share the same origins or economic base as their counterparts elsewhere in the region, they do share their neighbors’ penchant for employing the state for their own ends and systematically impoverishing it. Both the traditional and transnational elites have for years used the military and police to protect their personal land holdings and businesses. They have benefitted from the sale of public companies and lands, and they have enjoyed tax exonerations for their multitude of businesses. They have also pillaged its resources, and, as the government’s importance to the economy has grown, relied on it to generate more capital. Their dependence on the state has opened the way for a third set of what we are calling bureaucratic elites, who have developed a power base of their own because of the government positions they occupy. Honduras, meanwhile, has become one of the poorest, most unequal and indebted countries in the world. Any attempts to change this system have been met with stern and often unified opposition from elites of all stripes. And attempts to exert more regulatory control over the activities of the elites are smothered before they begin. It is little surprise then that the country offers criminals, large and small, one of the most propitious environments from which to work. On one side, an ineffective justice system and corrupt security forces, long exploited by these elites, opens the way for large criminal groups to operate with impunity. On the other side, an impoverished populace — which sees and understands exactly how elites abuse a broken system — seeks to get its share by working directly with criminals in the illegal and legal enterprises these criminals operate. Crime, as it turns out, is one of the few forms of social mobility. It is within this gray area that the elites themselves also interact with organized crime. Far from being distant from illegal activities, the elites have long operated in this realm. From dealing in contraband goods and services to buying permission for their illegal dealings and “get-out-of-jail-free cards,” those who do politics or business in Honduras understand that the laws governing the nation of eight million people are but a means to make money. Their connection to the underworld therefore is about societal, commercial and political interactions in the multiple spaces where business and politics happen in Honduras. The result is an organic relationship with organized crime that helps some elites reach the top and others stay there. Honduran elites have a peculiar history compared to other elites in the region.2 The country’s economy was built on exports, like its neighbors. Unlike them, however, Honduras’ principal export industries — first mining and then bananas — were almost wholly foreign owned. Local economic elites were enmeshed in cattle and other agro-industrial projects and formed the backbone of the traditional political groupings, the National and Liberal Parties. But a strong, local elite based on the control of land and agro-exports, of the type found in the other countries in the region, did not materialize. The most famous of these monopolies was United Fruit Company, which Sieder argues “consolidated its hegemony” over local politics in the 1930s and 1940s during a military dictatorship.4 Meanwhile, a smaller more traditional, landed elite shared power — first with these foreign companies and later with foreign settlers who concentrated their efforts on facilitating foreign-owned businesses and controlling the influx of foreign capital.5 These immigrant communities arrived from Europe and the Middle East throughout the 20th century. They have since been dubbed the “transplant” or “transnational” elites (or “Turcos,” a broad-sweeping and quasi-racist reference to their Middle Eastern origins). These transnational communities established control over what have become the dominant industries in Honduras: the financial and service sectors, telecommunications and media. They also acquired land, competing with and eventually overtaking the traditional elite’s hold on the agrarian economy as it shifted towards non-traditional exports. This traditional elite was largely land-based, depending on activities such as cattle, coffee and cacao to exert its influence. But it never coalesced the way landed elites did in neighboring Guatemala, leaving it largely sidelined, even as US capital slowly exited the country when commodity prices slipped because of increased, worldwide competition. Today, it can be difficult to differentiate between the traditional elites and the transnational elites. Although crossover is more commonly associated with the transnational than the traditional elites, both have diversified their economic portfolios, and both are deeply involved in politics. What is clear, however, is that Honduras’ top economic groups are run by relatively recent transplants that accumulated capital over the past half-century. The biggest business conglomerates in Honduras carry distinctly foreign names like Facussé, Maalouf and Rosenthal.6 Meanwhile, traditional, landed elites have shifted their focus to controlling government posts and elected offices. Two of the last three presidents come from cattle ranching families, and current President Juan Orlando Hernández is from a coffee family. For both the traditional and transnational elites, their business and political prospects are intertwined with a government that was, for most of its existence, less of an enforcer than an enabler. Throughout Honduras’ history, the state has been a source of both legal and physical protection for this export economy, the traditional landholding and transnational commercial classes. The public sector was seen, as Hugo Noé Pino notes, as a “concessionary state,” one that “stimulates investment but does not collect taxes.” The government was also a means through which the elites could expand their interests. The political parties represented, for many years, a manifestation of these elite interests. What came first for the transnational elite — economic or political power — is a matter of some debate. As Noé Pino says, there are two visions of the political-economic nexus at the apex of power in Honduras: 1) that the accumulation of capital was intimately related to the political connections throughout; 2) that the accumulation of capital was what led to these close political connections. Certainly elements of both were at play. And as the country’s traditional exports declined, particularly in the 1970s, and therefore the power of the traditional elites waned, the transnational elites surged to take more direct control of the traditional political parties. Indeed, the state’s evolution during this period was intimately related to the development of the transnational economic elites. This class tied themselves to the traditional political parties, often making contributions to both parties during elections, ensuring their influence would remain intact whoever won. Noé Pino argues this group created business associations to channel their needs and influence, and that many of its members have been part of the revolving door between government ministries and the private sector that has characterized Honduras for at least the last half century. The dependence of the elites on the state security forces to protect their enterprises led to the emergence of the military as a political and an economic player. This growth was aided by the United States, which, fearing the rise of communism in the region, began training Honduran officers en masse and supplying greater amounts of aid,8 a process that would accelerate in the 1980s and help transform the institution forever. Members of the armed forces became what we are calling a “bureaucratic elite,” something we will cover in more detail in the first Honduras case study. Some of their offspring are the political and economic elite of Honduras today and the institution is at the center of the changing dynamics of power in the country. The influx in US aid came as traditional exports continued a steep decline, and the country tried to diversify its economy. At the behest of its largest donor nation, the United States, Honduras expanded its export portfolio, lowered tariffs, sold state-owned businesses, and gave financial incentives for local and foreign investment, mostly in the form of reduced taxes. In the 1990s, as US aid dropped precipitously, multilateral banks filled the void and pushed for further liberalization policies. Despite these broad failures, both the traditional and the transnational elites have found ways to keep making money at the expense of the vast majority of Hondurans. For their part, the transnational elites took advantage of the market liberalization policies that began in the 1980s, and dominate the textile industry as well as tourism and telecommunications. They have become particularly powerful in the service sector, financing and constructing malls, buying into international food franchises and profiting from one of the country’s largest sources of revenue: remittances. Remittances represent some 18-20 percent of the country’s current GDP, powering the internal consumption that drives the service sector’s growth. There were other new sources of licit and illicit revenue besides remittances, foremost among them are non-traditional agriculture projects such as African palm plantations and proceeds from the trafficking of drugs through the country. Drug trafficking money can itself be considered as a form of remittances, as the illicit capital resulting from this trade enters the Honduran economy, passing through the financial sector and fueling growth in the agro-industrial sector, construction and tourism industries. It is through this financial flow that the elites interact with illicit actors. As we shall discuss in more detail later, all forms of elites can benefit from this illicit economic activity, both directly and indirectly. Meanwhile, the traditional, landed elite has experienced a resurgence of sorts by re-gaining control of the traditional political parties, capturing the increase in state expenditures and controlling more of the flow of foreign capital via their hold on public offices. Like the transnational elite, this group sees the state as an enabler of business enterprises, although in their case the opportunities frequently come via publicly funded projects. The corruption in this system is endemic, widespread and infused.11 They use these monies to maintain their grip on power, undermining or ignoring the rule of law when it suits them. The battle for these resources is at the center of many political disputes and, in some ways, shapes the country’s government and political parties. The deal-making around these resources can get messy, as it involves billions of dollars. It is, in the end, seen by the elites as a zero-sum game: those who control the government levers control the spoils in this system; those who are separated from these levers, risk getting marginalized. As the dependence on these government resources increases, so does the need to control the government filters for these resources. The result of this growing dependence on state resources has been the emergence of the aforementioned bureaucratic elite. As illustrated in our first case study, the beginnings of these elites can be traced to the military rule of the 1960s and 1970s, and the de facto military control that continued through the 1980s. But it is in the last decade that these bureaucratic elites have become a force on their own and in conjunction with members of the traditional elites. This new hybrid elite’s most prominent representative is President Juan Orlando Hernández himself. Educated in a military school, Hernández has surrounded himself with military officers, including his brother who is a colonel in the army. He has placed military personnel in posts traditionally reserved for civilians, and has centralized control of the security forces and intelligence gathering under the presidency. The hybrid group under Hernández’s control, often referred to as the Colobrí Group, combines military personnel, local politicians and the landed gentry, and works closely with the state at the regional and national levels. Colobrí is Spanish for hummingbird. The resurgent traditional landed elites and bureaucratic elites have centered their capital growth on the control of government resources, and of key government posts that give access to various income streams. Those who control these posts use them to block other elites’ access to these income streams, and to penalize rivals. Their dependence on these government posts and funds is what drives these elites to create their own political movements or develop factions within larger parties, as well as establish private companies that service the government’s needs. Obtaining and maintaining these political posts is of the utmost importance, and it is within this context that the darkest alliances occur. The elites must gain public and private backing for their bids for government office. This backing comes via direct financial contributions, media coverage and support, as well as networking, and local political and economic alliances. The candidates constantly jockey for position, and their various suitors are ever-changing. Among them are the powerful actors of the Honduran underworld. 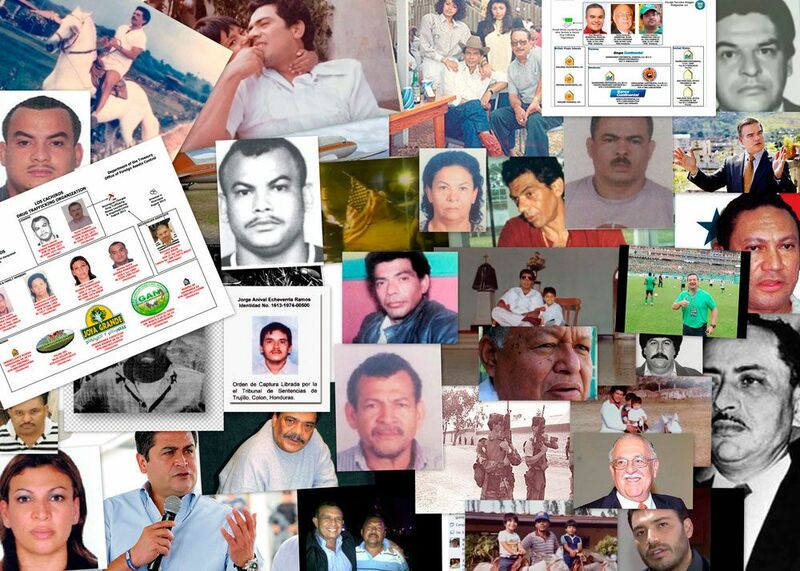 Strong, organized criminal groups in Honduras date back almost 50 years. At their highest levels, they have centered on facilitating the movement of illegal drugs such as marijuana and cocaine from the southern production regions to the northern consumer nations. More recently they have also facilitated the entry of precursor chemicals used to mass-produce synthetic drugs. The money garnered from this trade dwarfs many traditional businesses and has the ability to upset the balance of power on a local, national and even a regional scale. Second, there are local transport groups — or “transportistas” — that operate in Honduras. These are mostly Honduran families or tight business networks from the country that move legal and illegal goods through Honduras. They work closely with wholesale sellers and purchasers, as well as with other transport networks in Central America and elsewhere. They move shipments and can also store them for long periods of time. Neither job is easy. There are numerous rival organizations that steal and resell illegal goods. These include members of the security forces, which very often include the police. The transport groups also have to deal with multiple officials from border to border. However, if done well, transportation can be a highly lucrative venture. Finally, there are local criminal groups and street gangs operating in Honduras. These groups focus on less lucrative business ventures such as local drug distribution, extortion, kidnapping, and human smuggling. The competition for these criminal markets, in particular for local drug dealing and extortion, is what makes Honduras one of the most violent countries on earth. Gangs routinely eliminate rivals and have internal purges. They also deploy corrupt security officials to attack rival groups. Their territorial control in some areas is absolute, although their interaction with elites is minimal. 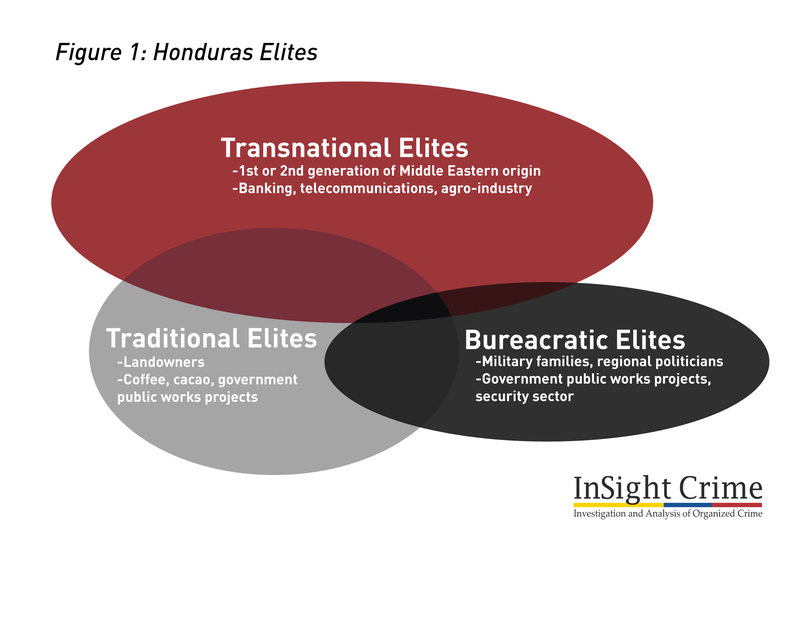 The criminal groups that have the most interaction with elites in Honduras are the transportistas and the TCOs. As we shall see in our case studies, these organizations need authorities to help them move illicit goods through a difficult terrain. They interact with security forces to ensure safe passage, and interact with powerful businessmen to launder proceeds and legitimize their illicit capital. Throughout, they establish political contacts, funding candidates for public office in an effort to obtain high-level protection and more business opportunities. The money garnered from this trade dwarfs that made from many traditional businesses and has the ability to upset the balance of power on a local, national and even a regional scale. This was best illustrated in Latin America during the late 1980s, when Colombia’s infamous trafficking organization, the Medellín Cartel, began kidnapping elites, assassinating judges and policemen, and detonating bombs in public places. However, the roots of this dynamic can be found many years previously when Colombian, and later Central American and Mexican criminal organizations, began to move cocaine and other drugs to the US market. The pioneer for this transport activity in Honduras was a man named Juan Ramón Matta Ballesteros, the subject of one of our Honduras case studies.13 In the 1970s, when Matta Ballesteros emerged as a prominent trafficker, Honduras already had criminal groups that were involved in this transport business.14 Matta Ballesteros’ distribution network eventually stretched from Colombia through Mexico. His allies in Mexico became known as the Guadalajara Cartel, which would later spawn some of the most important criminal groups in that country: the Sinaloa, Juárez and Tijuana Cartels. His allies in Colombia were members of what would become the Medellín Cartel. In 1985, everything changed when the Guadalajara Cartel, seemingly angered by a US Drug Enforcement Administration (DEA) operation to seize large tracts of its marijuana crops in Mexico, kidnapped and killed Enrique Camarena, a DEA agent. With Camarena’s death, the United States government began a law-bending quest for justice. Over the next several years, numerous Guadalajara operatives and leaders were arrested and convicted in Mexico. Matta Ballesteros was arrested in Colombia, but with the Medellín Cartel’s help, he escaped and made his way back to Honduras, where he felt protected by his vast network and wealth. In 1988, capitulating to US concerns about Matta Ballesteros’ increasing influence, the military and US Marshals intercepted him following his morning jog, bundled him up and transported him to the Dominican Republic where US marshals officially arrested and charged him with participating in the murder of Camarena, among other criminal acts. From there, he was taken to the US. Up to 2,000 two of Hondurans, mostly students angered by the move, attacked the US embassy, setting fire to several annex buildings and burning vehicles. At least four of the protesters were killed, and US officials said it took two hours for the Honduran authorities to respond their their call for help.18 Matta Ballesteros was later convicted in a Los Angeles court of kidnapping19 and drug trafficking, and remains in a US federal prison. 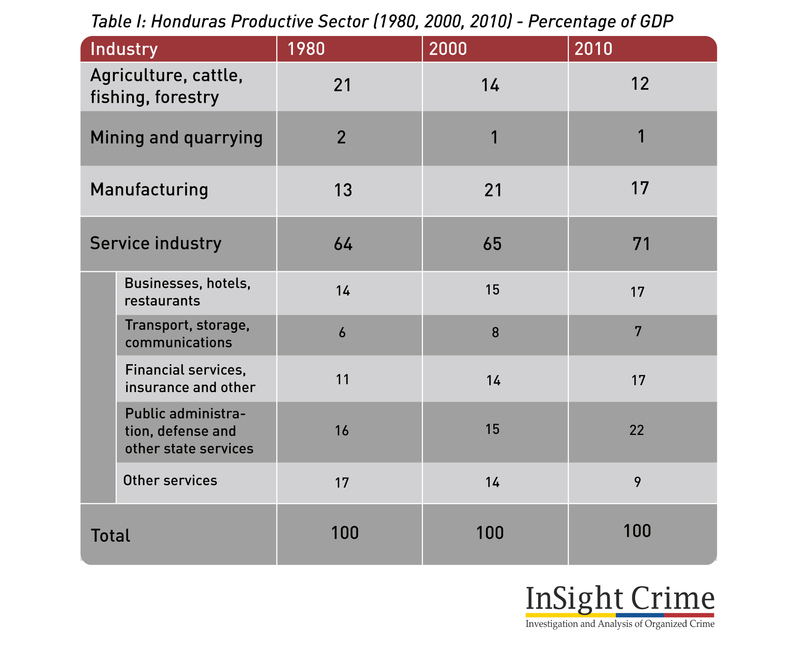 In the early 2000s, Honduras experienced another surge of drug trafficking activity. At the time, Mexican criminal organizations that had emerged after the demise of the Guadalajara Cartel were establishing more control over the distribution chain, and began using Central America as their primary bridge. Several local transport groups emerged. Among them were Chepe Luna’s in El Salvador and Honduras, José Miguel “Chepe” Handal Pérez’s group in San Pedro Sula, the Valle Valle family in Copán, the Zelaya clan in Atlántida, and the Cachiros organization in Colón.22 The Cachiros are the subject of one of our Honduras case studies. 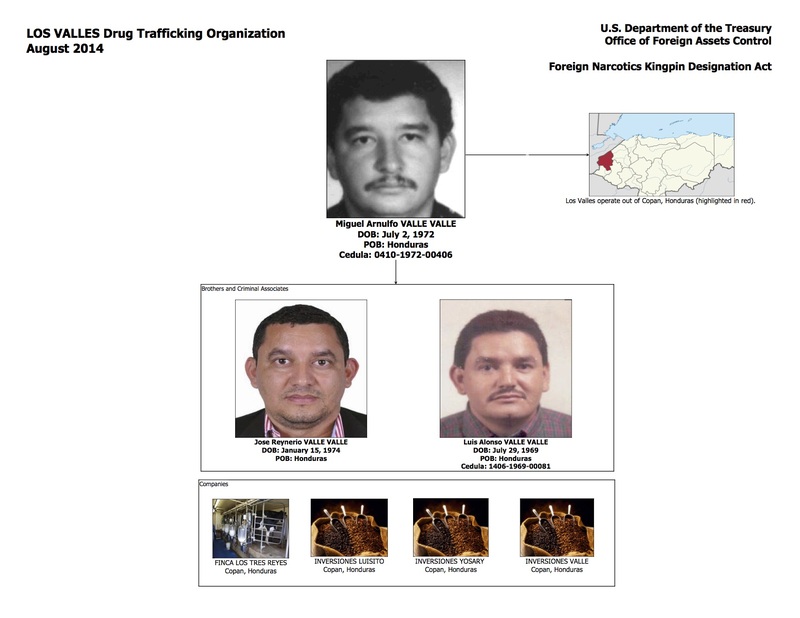 These groups’ main function was moving cocaine through the region, but they also had numerous side businesses such as human smuggling and local drug distribution. The criminal organizations’ ability to accumulate capital and wield this economic power to their advantage is largely hidden from view, since Honduran authorities have developed few strong judicial cases against them and there is not a vibrant local media. What’s more, public officials threaten these interests at their own peril. In December 2009, police assassins killed Honduran drug czar Julián Arístides González, and two years later his outspoken one-time advisor, Alfredo Landaverde was gunned down. Investigating detectives quickly determined that the triggermen were police officers operating under orders of top police brass. But the detectives just as quickly buried those investigative reports, and they did not come to light until years later. In April 2013, gunmen assassinated Orlán Chávez, the country’s top money laundering prosecutor.33 The day before his death, Chávez had led a raid on several of aforementioned Chepe Handal’s suspected properties and seized them. Suspicion fell on Handal, but the case remains unresolved. 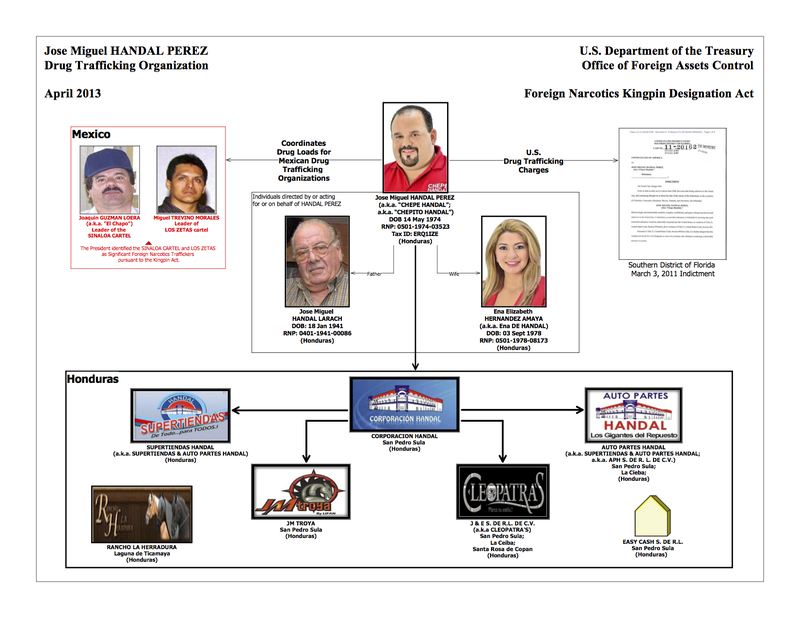 The economic might of these groups only began to come into view when the United States deemed Handal, and then the Cachiros, as specially designated narcotics traffickers, and placed them on the so-called “Kingpin List.”34 Handal’s business holdings included various auto parts stores, a motorcycle distributor, and a clothing store. A US indictment, issued in the Southern District of Florida, called for him to forfeit $38 million in proceeds from his illicit business dealings. After authorities began raiding the Cachiros’ properties in September 2013, however, it was clear that Handal was small by comparison. The US Treasury, in its “Kingpin” designation, named five businesses that it said belonged to the organization,35 and officials from both countries estimated the group’s assets were in the hundreds of millions of dollars. In later part of 2014, US and Honduran authorities also targeted the Valle Valle family organization. That family’s assets, the US Treasury said in an August 2014 “Kingpin” designation, included several coffee plantations and a cattle ranch. The group, the US Treasury declared, was moving upwards of 10 tons of cocaine through Honduras per month. 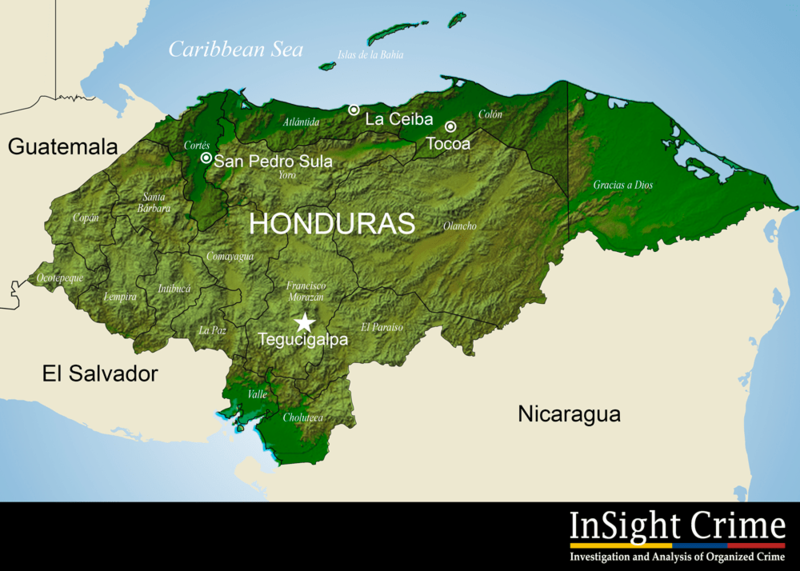 Rough calculations by InSight Crime put the group’s annual earnings near $300 million or about 1.6 percent of Honduras’ GDP. Perhaps more important than their coffee and cattle holdings was the group’s direct link to Ardón, the mayor of El Paraíso, and to his brother, Hugo.36 Between the two of them, the Ardóns managed dozens of state contracts which facilitated the movement of money between themselves and their legitimate and illegitimate partners. The merry-go-round created by this type of money flow is a critical part of understanding how corruption and crime work in places like Honduras. Money moves from state coffers into licit and illicit businesses whose owners then bankroll the candidates who are financing their projects or facilitating their money laundering activities. In the process, the Honduran public is left out of the loop. The Ardón brothers had the perfect machine to keep this merry-go-round spinning. But by late 2014, the Honduran government appeared to have them in its sights, making veiled references to the network in the press (calling it the “Cartel de Alex”). The network had created a powerful group that reached the highest echelons of power in Honduras. This, as our case studies illustrate, is the norm in the country rather than the exception, and it is changing the entire complexion of Honduras‘ ruling elite. *This report was written by Steven Dudley. Dudley, Javier Meléndez — who acted as coordinator for research for this project — along with researchers from the Centro de Investigación y Promoción de los Derechos Humanos (CIPRODEH) and the Asociación para una Sociedad más Justa (ASJ), assisted in the investigation and production of this report. Map by Jorge Mejía Galindo. Graphics by Andrew J Higgens. Bertha Zúñiga Cáceres, in April 2017, in Brussels, where she met with representatives dealing with business and human rights from European institutions (Commission and Council, buildings in the background), and representatives of the Belgian Foreign Ministry. Bertha Zúñiga Cáceres, the new general coordinator of the Civic Council of Popular and Indigenous Organisations of Honduras (COPINH), a position held by her mother, Berta Cáceres, until she was murdered on 3 March 2016, tells Equal Times that the indigenous people of this Central American country have development proposals for foreign investment funds that are prepared to listen to them. As well as being viable, they are proposals that respect the environment and human rights. The activist carries the struggle to defend the environment and the underprivileged in her genes (her mother was awarded the Goldman Environmental Prize and her grandmother, Austra Berta Flores, was the mayor of La Esperanza, governor of Intibucá and deputy in the National Congress, to mention just two from a long line of examples). She is currently campaigning against projects backed by the Central American Bank for Economic Integration (CABEI), under which blatant human rights violations are being perpetrated with impunity. Honduras is the deadliest country in the world for environmental defenders, according to a report by Global Witness. As many as 101 environmentalists were assassinated between 2010 and 2014. Many others suffered threats and intimidation, which have virtually become part of everyday life for activists. “The climate of defencelessness affects everyone,” she insists, going on to explain how the attacks against her personally have escalated in recent times. In addition to the ongoing stigmatisation, harassment and repression, on 30 June of this year, she was the victim of an armed attack and an attempt on her life, despite the fact that observers from around the world are keeping a close eye on the situation. Zúñiga Cáceres is keeping up the fight to ensure those who perpetrated and ordered her mother’s assassination are identified and brought to justice, in a country where impunity is the norm. What stage has been reached in the investigation into the murder of Berta Cáceres? Do you think it could set a legal precedent for other lower profile cases in Honduras – given that your mother is an emblematic figure and the international community is following the case very closely? That is the idea, to set a legal precedent in a country where there is no justice. The problem is that this doesn’t seem feasible in Honduras, not so far at least. You have to remember that Honduras has an impunity rate of 96 per cent, which is what makes killing people so easy. The idea is to strengthen the legal and judicial institutions in the country, so that they become an example, but the truth is that there is no political will and when there is no political will, it’s difficult to imagine that this can be achieved. Internally, we are pressing ahead with litigation, as private parties, with the support of many people in Honduras and beyond. We know that there is a great deal of international observation… But we feel disappointed. And worried, because no sentence has been pronounced [against the eight people remanded, to date], and this could be dragged on for a year, two years… until the international pressure dies down – which is the only concern of the institutions in Honduras – and then there will be no investigation into who was behind the crime. Following the murder of Cáceres, Leónidas Rosa Bautista, the Honduran ambassador to the OAS, announced a battery of measures to tackle the human rights abuses, such as the creation of a human rights observatory and a commission with human rights defenders to promote protection measures, etc. How do you view this response? The mechanism to protect human rights defenders was a response to the pressure from the international community and the conditions placed on funding in areas such as a military aid, etc. But in reality, it’s just an exercise to clean up the Honduran government’s image, because nothing has actually changed since the murder. We continue to be as defenceless as ever. Moreover, in the case of the COPINH in particular, the national campaigns on the radio and TV criminalising and stigmatising us have grown fiercer, and the government of Honduras is doing absolutely nothing. Honduras has a lot of laws, you could almost say it has more than it needs, but the problem is that they are not respected. The protection mechanism and such initiatives designed to ensure respect for the communities’ rights and to protect lives are a good thing, but the problem is that there is no trust, because information is leaked and there is corruption. People are afraid of giving their data a to mechanism when we know it could end up in the hands of the state security service, which is involved in a lot of the intelligence work and the persecution of the kind suffered by my mother. Honduras has the world’s highest murder rate for environmental defenders, per capita, according to the Global Witness report. It is rich in the natural resources exploited in a variety of industries, but it is not the only country of Latin America, or the world, with this profile. What makes Honduras so deadly? Honduras is a relatively small country for Latin America, with more than 30 per cent of its territory held in the form of concessions by extractive industry firms and clean and dirty energy producers of all kinds. The state exists to protect the interests of private business, the governments and public officials; not to safeguard the basic rights of indigenous communities. What is clearly reflected in the Global Witness report is the collusion between the government, private business, the military and foreign money. Honduras is a country that depends almost entirely on outside financial support – which is also why the messages from Europe weigh so heavily on it. Since the coup d’état in Honduras [ousting Manuel Zelaya in 2009], let’s say, we have been experiencing the same phenomenon as in other Latin American countries, only that here it has been much more fast-moving and aggressive. The mutation of states linked to organised crime and corruption facilitates the climate of impunity, under which people defending the land are killed. We know that what is in dispute in the world today are the natural commons, because that is where the energy is going to be taken from, it’s the new business. As a result, those of us who are working to defend ancestral lands – most often indigenous peoples – are faced with a very complicated situation. At the same time as talking about defending human rights, they are promoting energy production and giving incentives to companies linked to the oligarchs in our country. The result is a huge climate of permissiveness, allowing crimes to be committed so that the extractive and energy industry companies can move in, whatever the cost. Governments all around the world are constantly competing to attract foreign investment to their respective countries. They have to find solutions to growing populations, growing energy demands… What is the main problem you see with the type of investment currently flowing into Honduras and do you offer local alternatives, to be able to manage without it? Of course indigenous communities in Latin America present proposals that respect life and do not rely on the deadly private business in our countries. We would never promote private business. Our interest lies in covering our basic needs, and there are many proposals in this sense. I always remind people that my mother was murdered in the midst of an alternative energy workshop at which the Lenca community had gathered to discuss an energy model – developed by the indigenous communities themselves – that would not be linked to private business or investments with no interest in providing energy to the poor. There is no interest in promoting small projects; it’s a lie. Honduras has a number of national hydropower plants that are operating at 20% of their capacity, and this could be increased, but they limit it, so that they can say, “we need more energy, we need more hydroelectric power plants”. Honduras is part of a Mesoamerican electric transmission corridor, which is intended to generate energy for big industry, mining, mega-tourism projects and the energy demands of developed countries, which are the ones that need it. We always say that there could be more North-South exchange initiatives, proposals that respect our rights, that are not underpinned by racist policies – but they continue to view us as stupid, ignorant people that they need to civilise. There are many interesting proposals being made by indigenous populations to tackle these rights issues, the problem is that they are not allowed to flourish, there are no incentives for that kind of project. That’s not where the so-called development funds are going to be channelled. For us, part of our work is to clarify the situation, to break with the hypocrisy of making it look like they’re trying to help the least advantaged communities, because it is simply not true. They turn people into administrators of their poverty, and that is not what we are proposing or fighting for, not the COPINH nor other organisations. Our proposal is to take control of our goods, ensuring respect for our ways of interpreting the world and our spiritual beliefs, whatever is necessary. Do the projects funded by the CABEI respect your interests? The Central American Bank for Economic Integration is part of the structures of the World Bank. They promote projects that move in, whatever the cost, be it violence or murder, and benefit the oligarchs. Agua Zarca, [for example] is owned by the Atala family, the most powerful family in Central America. They lobby for the “renewable energy” producers in Honduras, part of the Honduran oligarchy that is reaping the financial benefits of all this. And they speak against organisations that defend the land, because we are affecting their economic earnings. They will not allow it. That is why they murdered Berta Cáceres, for being a hindrance. They don’t want any hindrances for private business in Honduras. They made quite strong statements against her and the COPINH. In a blog for Equal Times, researcher Karen Hudlet recently suggested a number of measures that companies could take to ensure that they do not act as accomplices to human rights violations, such as human rights impact assessments and regard for the context/environment in which they plan to operate. How feasible do you think this is? They are interesting ideas, the problem is that in Honduras there is no rule of law. There is a racist policy [behind it], so studies can be done, but it doesn’t mean they’re going to pull out their investment. If the investors start doing studies on the guarantees for life and basic rights, they will start to realise what the situation is, and to see that investing is not feasible.